This HC or Hunter Carbine version of the TX200 is a response to customers who wanted a lighter and more manoeuvrable version of the classic under lever rifle. Without sacrificing any of the power or accuracy that made the TX200 such a reliable performer, the carbine version is shorter for better balance between the hands. A common complaint with under lever rifles is that they are very front heavy, but that is not the case here thanks to the HCs elegant design. The sporter stock of the TX200 is shaped o fit snugly into the shoulder of any shooter whilst the deep cut laser etchings along its surface ensure a secure grip whilst adding a touch of class to the rifles appearance. The finish on the stock is also fantastic with a deep colouration and a rich gloss finish. 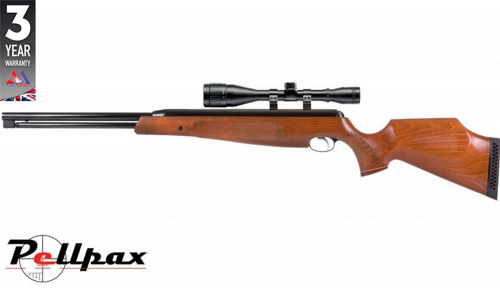 The rifle features a Lothar Walther barrel that has been machined to an impeccable standard of quality with precision rifling, ensuring the next pellet will land exactly where you place it. The two stage trigger of the TX200 is absolutely exceptional and really one of the rifles key selling points as it is crisp and predictable giving you the ultimate level control.